September 11, 2001 wasn’t the first time that religious fanatics launched a bloody terrorist attack in the name of God on that day of the year. On September 11, 1857, a wagon train led by Captain Alexander Fancher (Shaun Johnston) was headed for gold-rich California when it was ambushed by Mormons as it was passing through Utah. 120 men, women and children perished in the little-known incident slaughter now referred to as the Mountain Meadows Massacre. The faith-based slaughter was reportedly ordered by the territory’s Governor, Brigham Young (Terrence Stamp), who had declared martial law after hearing rumors that President Buchanan might be sending the U.S. Cavalry to depose him. 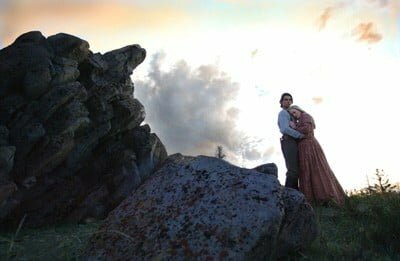 For the Mormons had relatively recently taken refuge in Cedar City after being run out of Missouri a decade earlier, victims of religious persecution including the murder of their Prophet, Joseph Smith (Dean Cain). So, Young dispatched Deacon John D. Lee (Jon Gries) to discourage Captain Fancher and company from stopping on their way out of fear that the strangers might get some fancy ideas about settling there permanently. When the weary wayfarers asked only for enough time to rest and recharge their batteries, Bishop Jacob Samuelson (Jon Voight) intervened on their behalf and they were initially granted permission to remain in the valley for a fortnight. Then, during this interlude, Samuelson’s son, Jonathan (Trent Ford), locked eyes with Emily (Tamara Hope), the cutest available female among the campers, and the two fell madly in love and made a commitment to each other. However, this development didn’t sit well with Jonathan’s dad, especially when he got his marching order from above to slay all the strangers as revenge for the Mormon lives lost back in Missouri. 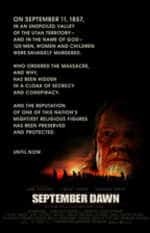 Released at perhaps the worst time for presidential candidate Mitt Romney, September Dawn is a graphic Western which sheds light on a shameful, long-suppressed stain on the resume’ of the controversial sect that later became the Church of Latter Day Saints. 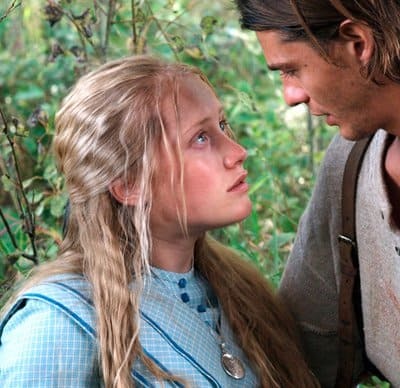 Not only does the movie remind us that Mormons have, historically, practiced polygamy, but now it adds to the mix the notion that they were once very violent religious zealots capable of committing ungodly atrocities. Luckily, Mitt can breathe a sigh of relief, since the film was slapped together on the cheap, being marked by such dubious dialogue, shoddy special f/x and sloppy editing that it doesn’t even measure up, cinematically, to an episode of your typical, cowboy TV show from the Fifties like Roy Rogers or The Lone Ranger. Get my drift, Kimosabe?